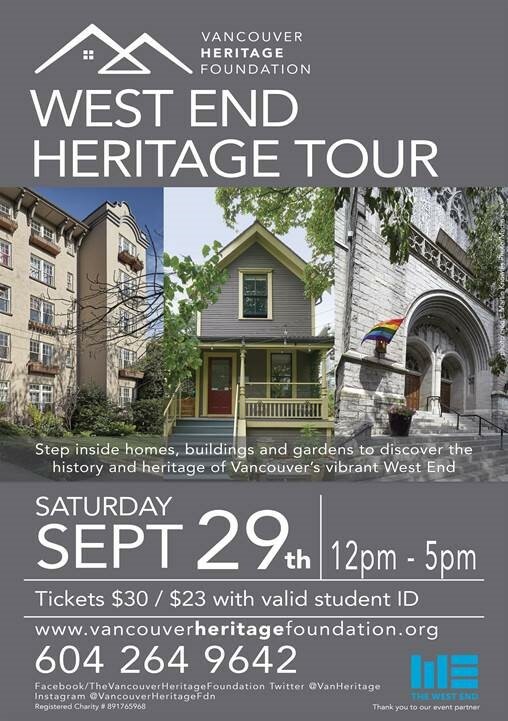 Vancouver Heritage Foundation is offering a limited number of sponsored tickets for the West End Heritage Tour! Running Saturday, September 29th only, this self-guided tour of Vancouver’s vibrant West End neighbourhood offers a chance to learn about the history and heritage of our city, while exploring inside 15+ culturally and/or architecturally significant sites. With all the stops located between Robson Street and English Bay, Burrard Street and the edge of Stanley Park, those without a car will be able to navigate the tour via public transit, walking and cycling. There is even a special offer for ticket holders through Mobi by Shaw Go for unlimited 30-minutes rides on tour day. Parking information and a discount through EasyPark is also available. There are only a few sponsored tickets available, so those interested should contact mail@vancouverheritagefoundation.org as soon as possible if interested. There is also a discounted rate on regular tickets for those with a valid student ID ($23 instead of $30). For more information about Vancouver Heritage Foundation and the West End Heritage Tour visit vancouverheritagefoundation.org.